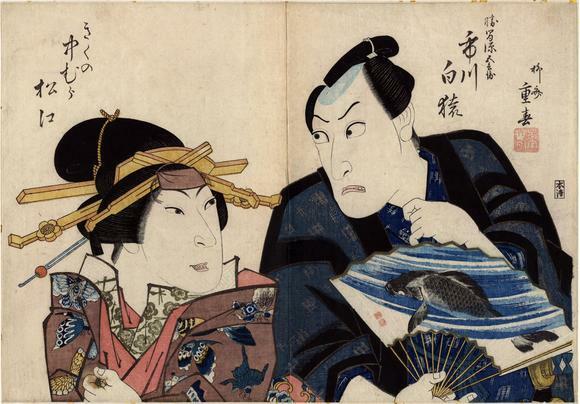 These actors performed in the kabuki play Godairiki Koi no Fūjime (五大力恋緘) performed at the Kita no Shinchi theater in Osaka in 1830/04. Danjūrō VII's pen name was Hakuen. Particularly striking is the fan held by Hakuen. Decorated with a fish, a carp?, swimming in the current. There are two red seals on the fan indicating the stamp of the 'intended' original artist. The back of the fish is remarkably detailed showing individual scales. The fan itself is also blind-printed showing all of the fold lines. This must have involved additional steps in this prints production. The bottom and top edges of the fan are printed with metallic inks imitating the fans we all know today that are made, i.e., edged, with metallic-like papers as both decoration and support. The outer robe of the female figure is decorated with realistic renditions of butterflies. These were liberally printed using Prussian blue, a new and expensive pigment at that time. An inner robe of prunus blossoms printed in metallic inks over previously printed interlinked swastikas, the manji motif, is remarkable. Visitors to this page should take advantage of the zooming tool to experience this magnificent diptych to its fullest extent. The Osaka stage name 'Katsuma Gengobei' was changed to 'Satsuma Gengobei' (薩摩源五兵衛) for the Edo audiences. There is another print of this character in the Lyon Collection by Toyokuni I (#208). It is truly one of the finest prints in the this collection.